Welcome to the Dorado Vida estate! 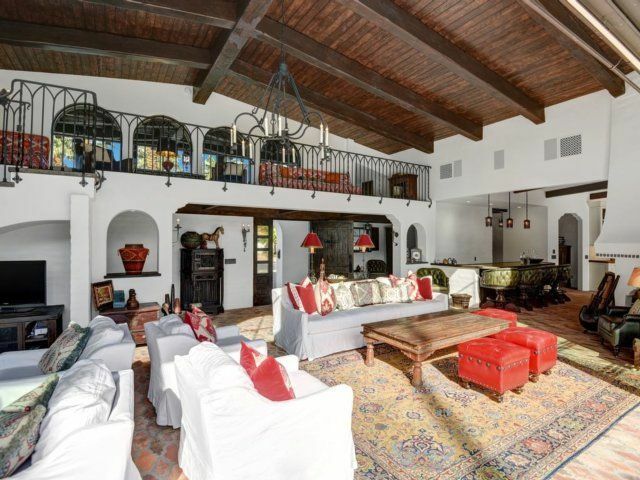 This brand new luxury California Spanish Revival style home resides on its own 2 acre private estate grounds and has 4 bedroom suites and an open loft bedroom/lounge with 5 full bathrooms and a guest powder bathroom. This remarkable home is newly constructed/finished in 2017 and is a designers dream using only the finest accoutrements and exquisite custom craftsmanship throughout . 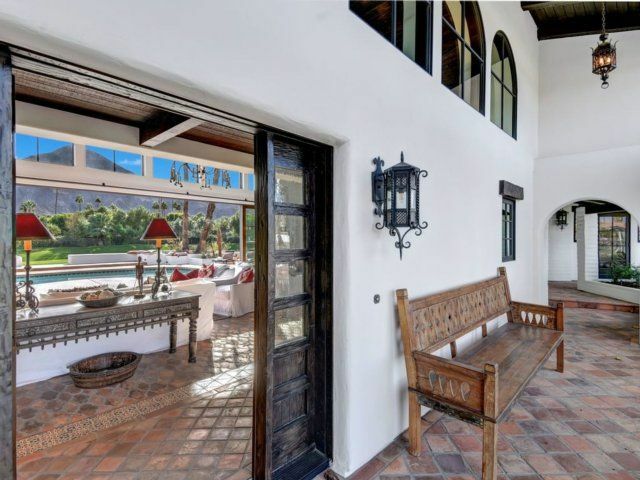 This is one of the most spectacular and breathtaking properties in the entire Indian Wells / Palm Springs / Coachella Valley region. Take a look at the stunning drone video of the home and property...and be prepared to fall in love with the Dorado Vida! Rental rates include concierge meet and greet at the estate to introduce and familiarize guests with the grounds and the home. Daily cleaning and chef cooking services can also be arranged upon request. 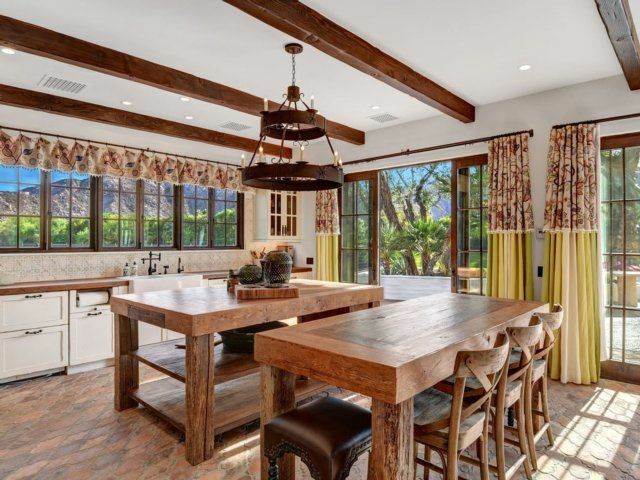 This beautifully landscaped expansive 2+ acre private estate has spectacular mountain views and is located in one of the most desirable and visually stunning locations in Indian Wells. It is only 2.5 miles to the Indian Wells Tennis Garden, 8 miles to the Coachella Music Festivals, and 20 minutes to Palm Springs. 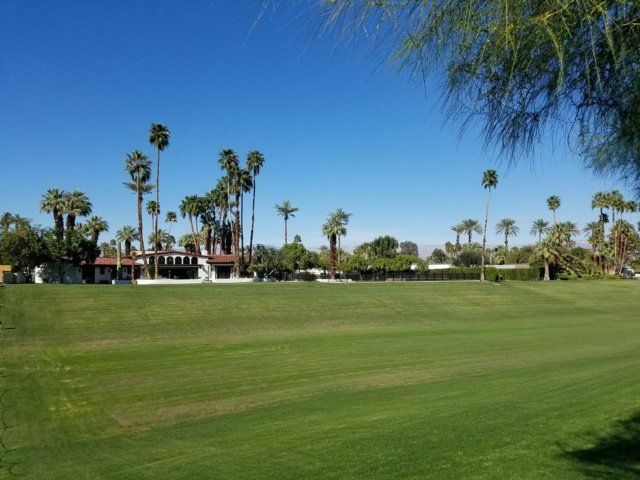 The property is located on the grass barranca between the Eldorado and Indian Wells Golf Country Clubs (both walking distance). The property is not on a golf course and the backyard sea of grass is our actual private property. 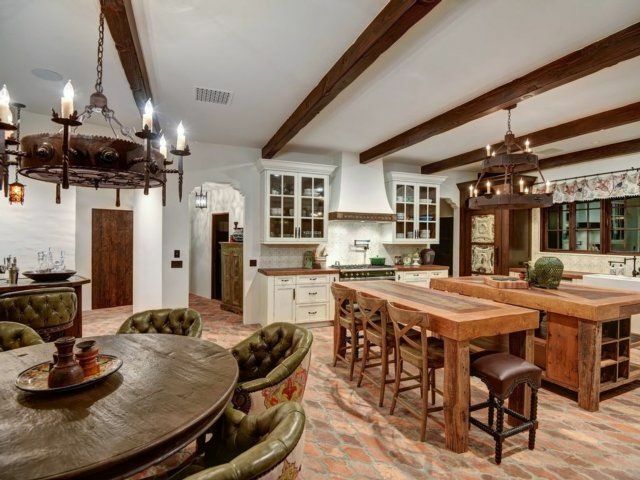 The house has a large living / dining / bar room all open area with a loft room/lounge above. 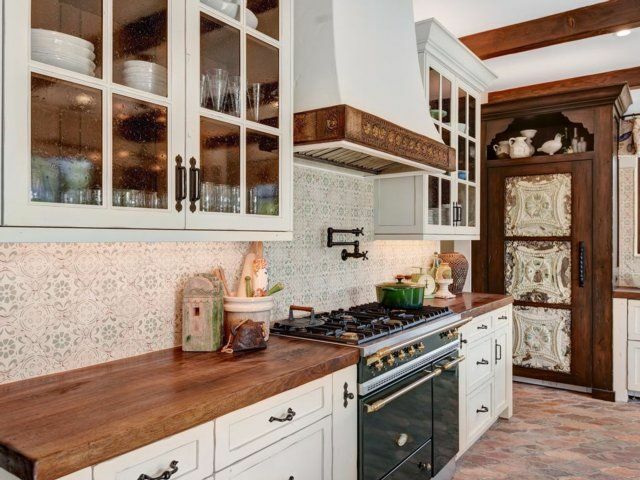 The large gourmet kitchen with walk-in pantry and ice makers is a chef's dream. Each of the four bedroom suites has reclaimed wood planked floors, both sheer and blackout curtains and their own unique hand painted tile bathrooms with walk in showers. The 2nd floor loft is open to the living room below and can be used as a lounge area with its two lounge couches and/or can be used as another bedroom as the couches change to full size beds and there is a third full size bed in a nook in the loft as well. There are a total of 8 beds in the house (1 California King, 1 King, 3 Queen, and in the loft are 1 Full lounge bed & 2 Full XL couch/beds). 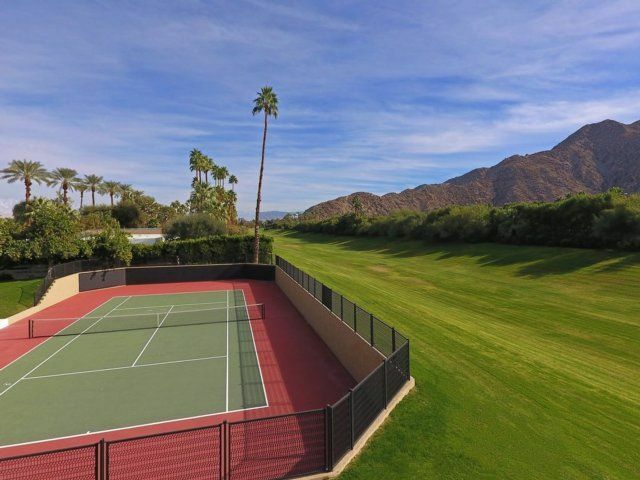 The amazingly tranquil property has it's own private tennis court with its brand new surface matching the Indian Wells Tennis Garden championship court. A Silent Partner Quest advanced automatic tennis ball machine is available for guest use. Private pool/spa and fruit orchards with a tree house are also on the property...relax, play, entertain. The home has the Sonos music system for interior and exterior guest music. Basketball, bocce ball, croquet, and horse shoes are all available for guest enjoyment as well. The house looks out onto it's own private 1+ acre grass barranca backyard area...great for chipping golf balls, football, volleyball, bounce houses, etc. 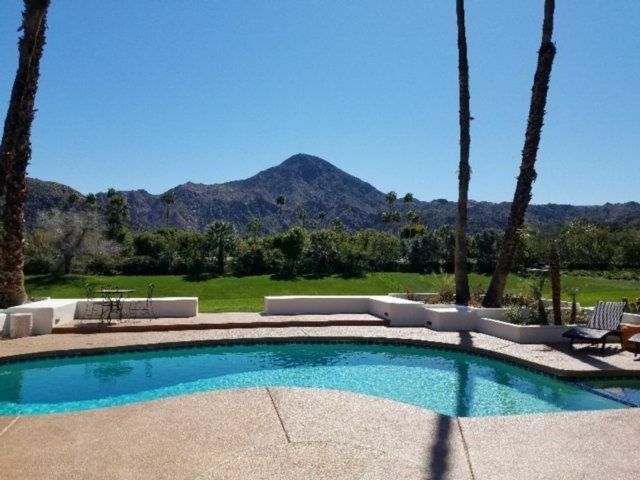 The incredible views from the interior of the house, backyard, pool, jacuzzi, tennis court, orchards, and grass barranca all look out to Eisenhower Mountain and the winter snow covered peaks of the San Jacinto Mountain Range. The private orchards on the property provide fresh fruit that guests can partake in and enjoy daily. Fruits include grapefruit, tangelos, oranges, limes, lemons, apples, kumquats, and figs. There is a commercial grade juice squeezer available in the kitchen for guest use. This estate property is great for large families, corporate retreats, family reunions, etc. The house very comfortably sleeps 12 with children. The owner specifically advertises here that all bookings/rentals of the property are for a minimum seven nights/days. • El Paseo, the Rodeo Drive of the desert. Here you’ll find the best shopping and many of the best restaurants in the entire region...an amazing mile of walking, shopping and dining enjoyment! • The Golf Resort at Indian Wells, #1 PGA Tour golf course you can play in California and the Indian Wells County Club. • The spectacular Indian Wells Tennis Garden, home of the annual BNP Parabis Open Tennis Tournament. • The Living Desert, our remarkable zoo and botanical gardens, featuring 450 wild animals and fabulous activities for families and kids of all ages. • Hike to the top of Eisenhower Mountain Monument along the 4 mile long trail through the nature preserve near The Living Desert zoo. • Beautiful 1.4 mile walk to the local shopping center for coffee, breakfast, lunch, and dinner loved by locals...and a great 1 mile walk to the local spas! 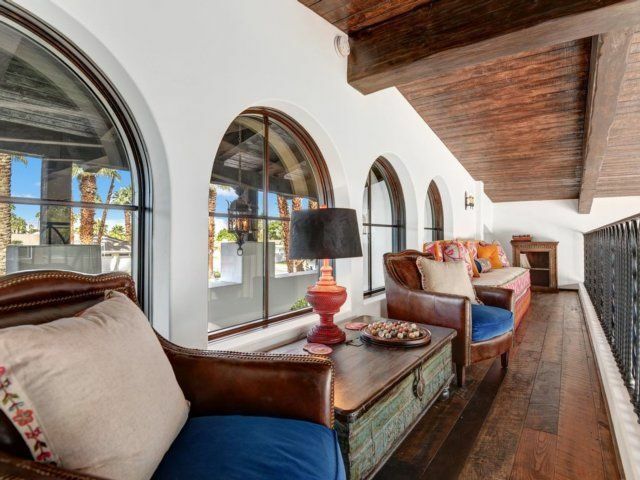 • The property is also located just 10 minutes from the Coachella, Stagecoach, and Desert Trip Music Festivals, the Coachella Polo Fields, and the ANA Inspiration and CareerBuilder Challenge golf tournaments. The Thermal Club motor speedway is just 20 minutes away too! • The impressive Palm Springs Air Museum is located just 20 minutes from the property. The Museum preserves, exhibits, and flies aircraft from World War Two, Korea, and the Vietnam Wars. • Located just 30 minutes away is the breathtaking Palm Springs Aerial Tramway, the world’s largest rotating tram car, which travels over two-and-one-half miles along the breathtaking cliffs of Chino Canyon, transporting riders to the pristine wilderness of the Mt. San Jacinto State Park. • And only 37 miles away is the Joshua Tree National Park...an amazing day trip!